The bustling Interstate 81 corridor that runs through Pennsylvania, Maryland, Virginia and beyond provides a critical link for commerce and the distribution of goods to the east coast megalopolis that extends from Boston, Massachusetts to Washington, DC. Hundreds of retailers and suppliers have strategically placed large-scale manufacturing and distribution centers in this region close to major interstate highways, intermodal rail yards and a strong work force. Over the years, Conewago Enterprises, Inc. has been fortunate to be selected to construct dozens of these buildings throughout the mid-Atlantic area. From refrigerated storage facilities and state-of-the-art manufacturing plants to dry goods warehouses, Conewago has provided expert design-build services for a wide variety of clients. In the spring of 2013, Conewago was tapped by Liberty Property Trust, a Philadelphia-based real estate development firm, to build one of the largest distribution centers in the United States. The 1,706,388 square foot distribution center was slated to be built on a 183 acre site near Shippensburg, PA in Franklin County. “People 500 miles away depend on people in the Shippensburg, Chambersburg and Hagerstown areas to get their daily goods and services,” said Michael Alderman, Vice President of Leasing and Development for Liberty. Conewago's team went to work, developing a plan to complete the largest building the company has ever constructed. The tilt-up concrete structure with conventional steel framing would end up being the size of 30 football fields and is listed as the 5th largest tilt-up concrete building on record. Perhaps the only thing more impressive than the scale of the project was the timeline in which it was completed. To meet the needs of Liberty Property Trust’s client, the building needed to be completed in just 13 months. An additional challenge Conewago faced in the early stages of site work was weak, silty soil conditions, which offered limited bearing capacity. Several sinkholes were also present on the site. To combat these conditions, Conewago utilized soil cement stabilization to increase the strength of the top layer of soil. This allowed the team to reduce the thickness of the floor slabs and paving sections, which helped save time and money. A key consideration from an engineering standpoint was the thermal expansion and contraction of a structure this large. Based on the local climatic changes, the distribution center was designed to allow for up to two feet of thermal movement, which was facilitated by incorporating a half dozen expansion joints into the building. “Throughout each step of the design-build process, Conewago incorporated best construction practices to meet our client’s needs, including extra height for storage efficiencies and strategic placement of steel columns to enhance safety and offer flexibility for future use of the space,” said Alderman. 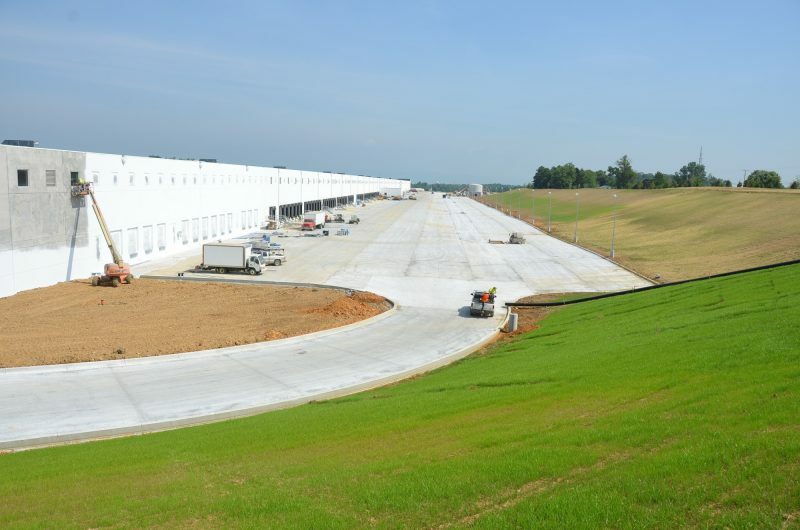 Another major element of the project was the massive paved surface around the distribution center where tractor trailers would load and unload goods. 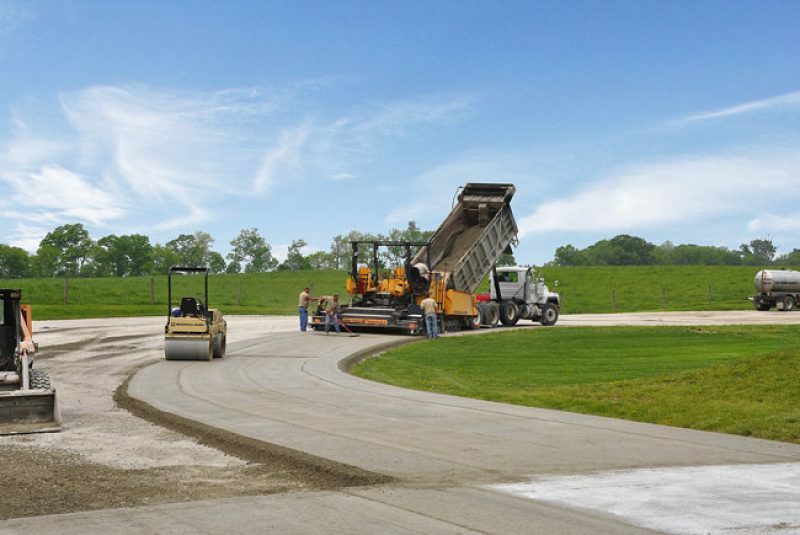 Due to the challenging soil conditions and the anticipated high number of daily cycles of fully-loaded tractor trailers over the surface, Conewago selected Roller Compacted Concrete (RCC) as the primary paving material. The use of RCC provided substantial savings for Liberty on the project. The ease of construction and high production rate of RCC helped Conewago stay on schedule and provided a surface that will stand up to heavy duty truck traffic for decades to come. 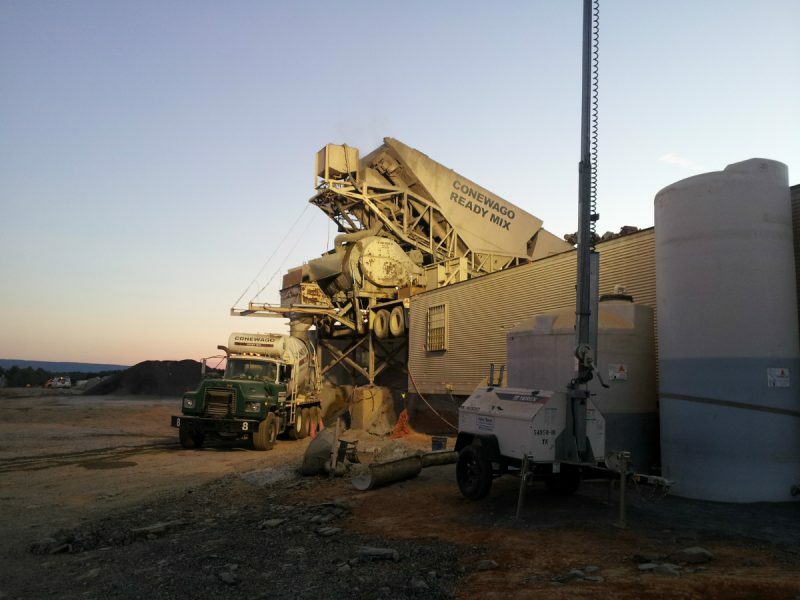 Over a four month period, Conewago placed more than 45,000 cubic yards of RCC on the Shippensburg project. Conewago is currently working on a second Liberty Trust distribution center site 30 miles down the road in Hagerstown, Maryland where 9,000 cubic yards of RCC were recently placed. With the completion of the Shippensburg project, Conewago has shown the value of concrete construction and added to their growing list of successful projects along the I-81 Corridor. The company remains well- positioned to serve as a comprehensive resource for businesses seeking to establish or expand their manufacturing and distribution presence as commerce continues to boom in this area.